My wife and I saw the first episode of Once Upon a Time back when it first aired in 2011, and although we enjoyed it we forgot to create a TiVo season pass and so ended up not seeing any other episodes. 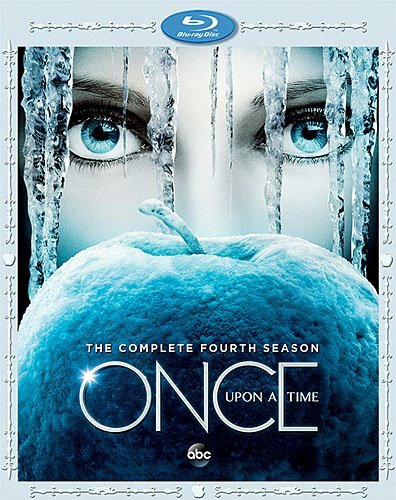 Then a week or so ago I found a review copy of The Complete Fourth Season of Once Upon a Time in our mailbox. So I just finished binge watching all 23 hour-long episodes and I must say, I enjoyed it a lot more than I though I would. Even starting out with season 4 it didn't take me long to figure out what was going on. This season starts by introducing Elsa and Anna, the two princesses from the popular Disney animated feature Frozen . The casting for these two characters was spot on, they really captured the personalties of the characters from the animated film. The Elsa and Anna storyline flashes between present day in the real world town of Storybrooke and the fantasy world that Elsa and Anna come from. In the present day Storybrooke, Elsa is confused by her arrival and accidentally raises a magical ice wall around the town until she can find her sister, Anna. While she is on her quest with the help of The Savior and gang, Anna, in the past and in the fantasy world, takes off on a quest of her own to find out why their parents left. This Elsa/Anna storyline only lasts for half the season, but it's an enjoyable story made even better by Elsa's upbeat personality and the mysterious Ice Queen. The second half of the season focuses on three classic Disney villains, Cruella De Vil, Maleficent, and Ursula who find their way into Storybrooke so they can help Rumpelstiltskin find the powerful Author in order to rewrite fairy tales to give the villains happy endings. And it turns out that Snow White and Prince Charming are have some secret about a terrible horrible thing they did in the past. The story is intriguing until the end and has a satisfactory conclusions, not some annoying cliffhanger. There are smaller sub-stories all throughout the season and it all just adds up to a good time. It made me want to go back and watch the previous seasons. There are also some good extras included, like an audio commentary, deleted scenes, and a featurette about bringing the Frozen characters into live action. There's also bloopers and a couple other extras. Even if you haven't had any interaction with this show, coming in at season 4 won't hinder the enjoyment of the series. It's a good show and this is a well done release. Behind the Magic Tour - Join hosts Ginnifer Goodwin and Josh Dallas for a a fun, exclusive tour of one of the most magical places of all - the show's stages. Three Who Stayed - Meet the brave souls who chose to remain in Storybrooke when disaster struck.